Norman Veber displayed the new reassembled car for the first time at the September MAMA meeting. We were delighted to once again set eyes upon the model's smoothed and taper-sectioned body and it's widened fenders.We could once again marvel at it's operational front and rear suspension. The builder, Dave Turner, was a machinist who viewed the model as a way to apply his technical skills to his hobby. The rear axle is a modified Big Deuce quick-change that now accepts bolt-on rear cover and axle tubes. Dave machined the dropped I-beam front axle from a single aluminum billet. Tires from a Monogram Golden-T kit are wrapped around Dave's one-piece machined aluminum wheels, which are mounted to scratchbuilt cross-drilled aluminum brake rotors. Machined aluminum calipers and hubs complete the disc brake assemblies. 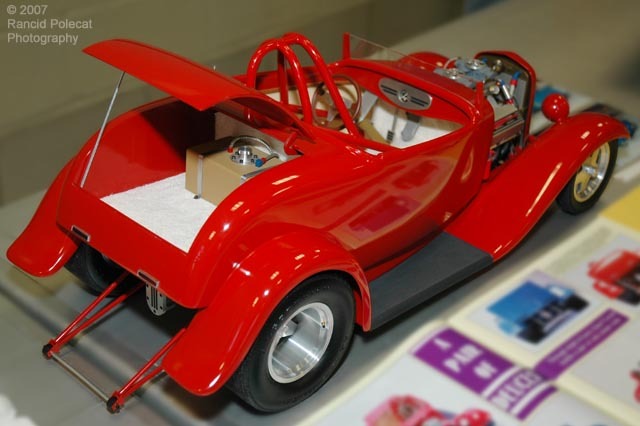 The highly modified body (wedge section and widened fenders) is coated with Zynolyte Bright Red paint.